Copyright © 2018-2019 W3C® (MIT, ERCIM, Keio, Beihang). W3C liability, trademark and document use rules apply. This document is for people who make Web content (Web pages) and Web applications. It give advice on how to make content useable for people with learning and cognitive disabilities. This document builds on the Cognitive Accessibility Gap Analysis and Roadmap , Cognitive Accessibility User Research [ coga-user-research ] and Cognitive Accessibility Issue Papers [ coga-issue-papers ] to evaluate where user needs remain to be met in technologies and accessibility guidelines. This document was published by the Accessible Platform Architectures Working Group and the Accessibility Guidelines Working Group as an Editor's Draft. Comments regarding this document are welcome. Please send them to public-coga-comments@w3.org (archives). This document was produced by groups operating under the W3C Patent Policy. W3C maintains a public list of any patent disclosures (Accessible Platform Architectures Working Group) and a public list of any patent disclosures (Accessibility Guidelines Working Group) made in connection with the deliverables of each group; these pages also include instructions for disclosing a patent. An individual who has actual knowledge of a patent which the individual believes contains Essential Claim(s) must disclose the information in accordance with section 6 of the W3C Patent Policy. Making websites and applications that are friendly for people with cognitive impairments affects every part of design and development. Traditionally accessibility has been most focused on the interface, and making that usable for people with sensory and physical impairments in vision, hearing and/or mobility. Some accessibility features will help people with cognitive impairments, but often the issues are about context, language, usability, and other more general factors that impact everyone to some degree. This document aims to provide guidance on how to make websites and applications that are friendly for people with cognitive impairments by providing guidance for your designs, and design process. Some aspects of making things friendly for people with cognitive impairments are best dealt with as part of the overall design process. For most organizations there should be scope for taking a user-centred design process. Including people with cognitive issues in research methods such as usability testing. Review designs and early stage development with the design themes in this document. For organizations that do not include usability testing as part of the process, they could use this document to review designs and implementations. User needs for people with learning and cognitive disabilities (COGA) are often important for other users. However for COGA groups they often make the difference between being able to use the site or not be able to use it at all. safe way to interact online. use applications or APIs that remember a lot of my information so I do not need to enter it again, and to otherwise help me, such as with spelling. know where I am in a process, including what I have done and what my next step is. more explanations, such as context sensitive help and short tips. know how to get more information. symbols that help me understand content. contextually-relevant graphs and pictures to supplement text so I can understand a point without a lot of reading. speech support, with synchronized highlighting, so I can follow as I go. highlight section of image, chart, or math, while the section is read. more space between letters, words, sentences, and/or lines of text. not too many reminders, as I will be distracted. confident that I can manage my tasks. Clear and understandable content and text. quickly identify options I need. Any time there is a 'target audience', there will be people with with learning and cognitive disabilities in that audience. Cogntiive issues are often invisible in day to day life until people encounter particular challenges. To provide some context and understanding eight personas have been created which outline fictional people with various cognitive issues and the challenges they face. Personas for learning and cognitive disabilities. Usability testing is the best way to know if your content and functionality works for real people with cognitive and learning disabilities. Usability is a key factor for everyone, if something is difficult to use it is cannot be accessible. 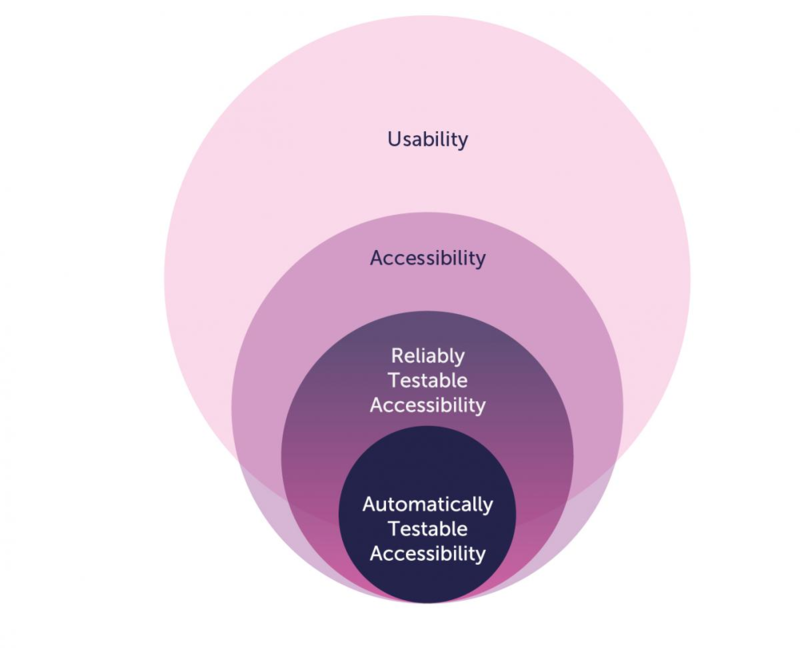 Automated testing for accessibility tends to focus on more technical areas of accessibility, and cannot assess how easy something is to use. It is vital for people with cognitive disabilities that teams do not rely on automated testing alone for accessibility, but incorporate design requirements, and if possible test with people who have cognitive disabilities. How to Conduct Usability Testing from Start to Finish, from UX Mastery. Ensure the person does not feel like they are at fault for making mistakes; this is a likely scenario for people with cognitive impairments. The next few paragraphs up to the next section may be removed as it is both covered in usability guidance in the links above and significantly incomplete in comparison. We would be interested in finding out if anyone finds it useful to include. Can your users ( people with learning and cognitive disabilities) manage each task reasonably easily and fast. You can time the task taken to complete, and note any parts that where the users are slowed down or seem to struggle. Also note any errors that they making including clicking on the wrong thing. Is completing the task frustrating or upsetting? ask them if anything was annoying. ask them how they feel about the system and if anything was annoying. If the user if failing blame the designer and not the user. Such as “ it is so helpful that you are doing this because our designers are not very good, or are always playing computer games so they think everyone is good at this stuff” or “you are really helping us make this useable by real people and not just engineers” . Stop the process if users are getting distressed despite this. user’s mood and comments to measure satisfaction. What prevents the user from completing a task? What creates confusion? When and why do they misinterpret the interface? What produces an error and an incorrect action? When does the user misunderstand navigation, menus and controls? Note you will need to get informed consent from the tester before testing. Explain what they will be doing and why it is helping you. If there are any risks they need to be explained and understood. If your tester has a guardian you should get informed consent from both the tester and their guardian. Make sure potential participants are aware they can withdraw from the testing situation at any time and that their comments will be anonymised before being used in any report. Design so that as many users as possible understand the site and know how to use it. This often involves using things that are clear and familiar to the user so that they do not have to learn new symbols, terms or design patterns. Personalization and good use of semantics can help make the symbols and design as familiar to the user as possible. People with cognitive disabilities rely upon predictable behavior in digital content. For example, many websites do not follow the standard convention for hyperlinks: blue = unvisited; purple = visited; and underlined. See the design requirments for understandable design. Help the user find what they need. Navigating the system should be easy. See the design requirments for navigation. Use clear and understandable content This includes clear text, clear images, speech, and easy to understand video. See the design requirments for understandable content. Prevent the user from making mistakes and make it easy to correct mistakes when they do occur. A good design and use of scripts will make errors less likely, but when they do occur the user should know how to correct them, without having to render other data or start from the beginning. See the design requirments for errors. Help the user focus and restore context if attention is lost. Items like breadcrumbs can help orientate the user and help the user restore the context when it is lost. (Making breadcrumbs clickable can also help the user undo mistakes.) See the design requirments for focus. Minimize the cognitive skills required to use the content and avoid barriers that stop people with cognitive disabilities from using content, such as hard to use security mechanisms. When possible, provide more accessible options. See the design requirments for barriers. Provide help and support. Graphics, summaries of long documents, adding icons to headings and links are all examples of extra help and support. See the design requirments for support. Feedback is usable by everyone. If users have difficulty sending feedback then you will not know if they are able to use the content or when they are experiencing problems. Therefore, it is essential that all the feedback mechanisms are tested by people with cognitive disabilities. See the design requirments for feedback. The task force is taking all the design requirements and turning them into easy to read checkpoints. They will be divided by themes listed above. Most of the design requirements were originally created as recommendations for WCAG, the full list of potential requirements is available, and you can also review the progress of the task force in making readable requirements geared to web developers. The task force appreciates feedback on this work. The table of design requirements and user groups maps requirements such as "User safety" and "Task completion" with the groups of users who benefit, such as those with "Memory impairments" and "Reduced focus and context". The task force intends to redo this table when the easy to read design recommendations are complete. We intend to add sections on GPS systems, conversational interfaces. Design patterns and gathering and analyzing user feedback and data. Building a policy that include the important criteria for the scenarios included in your policy. This table needs to be completed for each design requirement. The task force would appreciate feedback on additional criteria that would be helpful for policy makers. A policy for legislation for wide adoption for all web sites might include any item that are testable, does not require human testing and have a high user need level. A policy for legislation for content needed in the workplace might include any item that are testable, and have a high or medium level user need level. Content that helps autonomy such as apps and interfaces to run home devices, book a cab, write an email etc. Cost associated with people leaving the work place earlier than necessary. This section is incomplete. The task force would appreciate receiving feedback of such as additional examples, scenarios and considerations. This section will have a detailed design guide. We are considering publishing it as a separate document. The group is working on a design guide to help make Web Content more usable for people with cognitive and learning disabilities (COGA).The guide is divided into themes. There are also user stories and testing methodologies for each theme. Just understanding the themes and user stories may help make your content more accessible to some users with cognitive and learning disabilities. Please see the section on user testing for guidance on how to perform COGA user testing. Design so that as many users as possible understand the site and know how to use it: See the design guide for understandable design. Help the user find what they need: See the design guide for navigation. Use clear and understandable content: See the design guide for understandable content. Prevent the user from making mistakes and make it easy to correct mistakes when they do occur: See the design guide for errors. Help the user focus and restore context if attention is lost: See the design guide for focus. Minimize the cognitive skills required to use the content and avoid barriers: See the design guide for barriers. Provide help and support: See the design guide for support. Feedback is usable by everyone: See the design guide for feedback. This publication has been funded in part with Federal funds from the U.S. Department of Health and Human Services, National Institute on Disability Independent Living and Rehabilitation Research (NIDILRR) under contract HHSP23301500054. The content of this publication does not necessarily reflect the views or official policies of the U.S. Department of Health and Human Services, nor does mention of trade names, commercial products, or organizations imply endorsement by the U.S. Government.